When the Department of Homeland Security launched a mobile app to send Freedom of Information Act requests directly to the federal government agency, it created a precedent. Unfortunately, it was a bad one. Instead of launching a better way for the public to make and track requests or teaming up with the Department of Justice to fund work on a universal FOIA request feature at the government's openFOIA website, the federal agency that receives and responds to the largest number of FOIA requests in the country actually made the experience of submitting one worse. The app lets you do a bunch of things you already could do on the World Wide Web: It was already possible to learn how to make a FOIA request online using a simple form at DHS.gov or regulations.gov, check the status of a request, browse the DHS FOIA library or read about exemptions using a mobile web browser. Instead of just making any of those webpages responsive to the device accessing them, however, DHS made a new mobile app with a tiny font size that duplicates them. What's worse, if you decide to try to use the app to make a request, you'll quickly run into a challenge: The soft keyboard of the touchscreen obscures the text you're typing into the form while you enter it. If you compose a request in a note and paste it in, you can get around the problem, but this is terrible mobile design. If you do manage to successfully submit a request and accurate description, the mobile app doesn't appear to retain a record of it locally. Instead, if you tap on "check status," you'll be prompted to enter a request number. Frankly, a user would be much better served using MuckRock.com to make and track a FOIA request. Four hours after making a request, I still hadn't received a confirmation email or number. On the one hand, in minimizing data collection from the app, the DHS Privacy Office is doing something laudable. On the other, it makes using it much more onerous. "I'd like to tell you what I think of the app, but I haven't installed it," said Adam Marshall, the Jack Nelson Legal Fellow at the Reporters Committee for Freedom of the Press. Marshall works on the committee's iFOIA request system. "The app's permissions, at least on the Android store, state that it requires access to your approximate location," Marshall said. "There is absolutely zero reason for the DHS to have access to the location of my phone, and I'm not going to install an app from the federal government that allows for that functionality. FOIA is designed to ensure that the public knows what the government is up to, not the other way around." 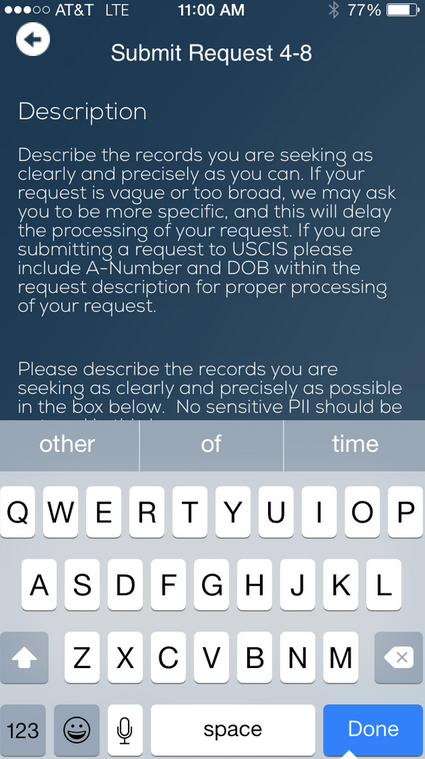 Why does @DHSgov's new #FOIA app require permission to track the location of your phone? https://t.co/EfbgG3048q Yeah, not installing that. The Amazon.com of FOIA requests, this is not. A representative from the DHS Privacy Office emailed me 3 1/2 hours after my request to thank me for contacting the agency and asked me to "please resubmit your request because it did not contain a request description.” In other words, DHS confirmed that a FOIA request exists, but they don’t know what it was about, exactly. (If I want to try again, I'll have to retype it all and send a new request.) I responded by asking for my FOIA request number so I could pull it up online and confirm it didn't save the text of my request. The DHS rep still hasn't responded, as of three hours later. The DHS privacy and public affairs offices did not respond to my phone calls or email requests for comment on the new app. Update: Two days after this story was published, DHS replied to my email. "The eFOIA Mobile app works as designed," maintained Marsha L. Catron, press secretary at DHS. "The application completed the stringent process of developing and introducing a new mobile platform and undergoing internal user testing prior to being released to the public. Our technical team welcomes and encourages feedback from the user community on the eFOIA app so that we can continue to work toward improving its functionality and the user experience." After using eFOIA, however, I was left with more questions than answers. What evidence of demand for a mobile app to file requests was there that led to this being deployed on the 49th anniversary of the Freedom of Information Act? Why didn't the existing online form suffice? 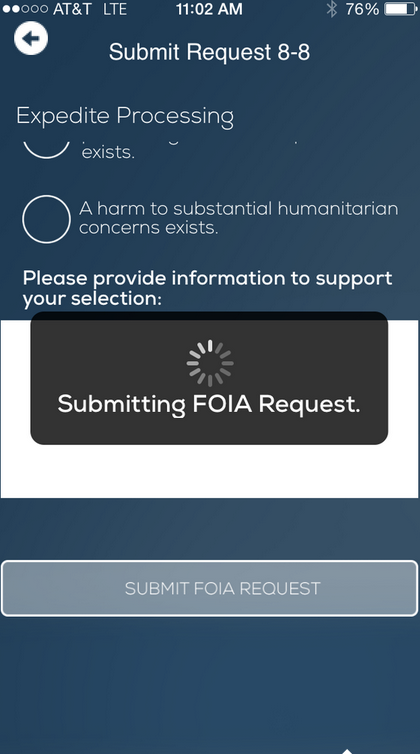 Who made the eFOIA app? How much did it cost? How much was it tested? Why doesn't the app retain the requester's contact information between requests, or a list of past requests locally? Why is DHS claiming copyright on the app in the iTunes store? I've asked DHS all of these questions. If I receive a response to them or to the FOIA request that may or may not have been submitted through the eFOIA app on my iPhone, I'll update this post further. Update: DHS disclosed that the app cost an estimated $174,867. For now, this looks like another diagnosis of "shiny app syndrome." A government agency is spending taxpayer dollars on mobile apps instead of making websites mobile-friendly, investing in proactively disclosing the most frequently requested documents or employing more FOIA officers to handle the record-setting load. 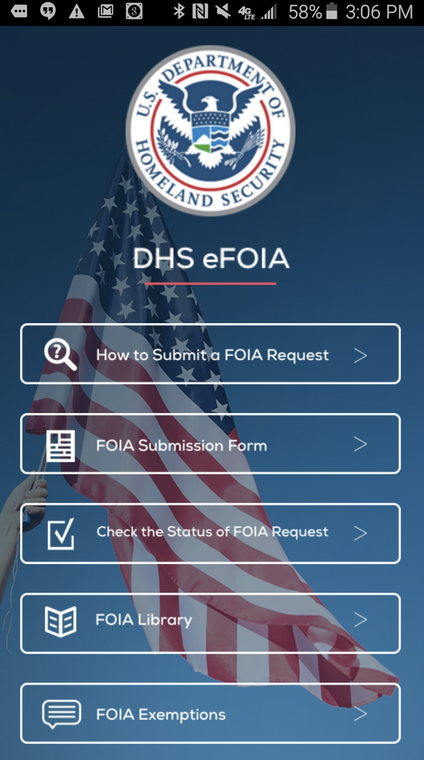 Update: ﻿On July 23, DHS quietly updated the eFOIA app. Version 1.3 "removed the need for CoreLocation," fixed the "keyboard hiding text entries" issue and fixed an "issue with submission Step 2 validation." DHS is still claiming copyright on the app on iTunes.